My next novel has a comedic take on the Technological Singularity, so I thought I’d start to do some more posts about the topic here on The Skwib. The following video is a kind-of companion piece for a Time article that came out earlier this year about the Singularity and one of its main proponents, Ray Kurzweil. It is presented by the Earth’s “premier science comedian”. I’m not sure what the hell that means, but it is funny! The Frankenstein myth predates the story told by Mary Shelly, incidentally. A form of it is as old as Prometheus, in which the Titan steals the secrets of civilization and gives it to human beings. (Zeus doesn’t like this very much, and punishes Prometheus by forcing him to donate his liver to a large avian of the family accipitridae on a daily basis.) In Jewish folklore there is the golem, which is created from clay and in many accounts destroys its creator, largely because it’s so difficult to find a decent corned beef sandwich in medieval European cities. In most of these stories, at heart is the idea of human hubris — an overweening pride or arrogance that defies the gods, or in modern stories, reality. Well, that and dodgy meals. Hubris has always been a component of the human heart. Without it we wouldn’t try to create things, but if we rely on it too much, we can get ourselves in trouble. Most of our problems with technology stem from this irrational confidence that we can control our own creations — something that is manifestly untrue. If you ever get the feeling that our technology is out of control, you’re not alone. And you’re more sane than those who believe technology is something we command at will. It’s a bias we all have, because it’s rational. We can control individual technologies, in the absence of other technologies and systems. But once they start to interact, they become more difficult to understand. The very rationality that allowed us to create science and technology in the first place now undercuts our ability to understand the gestalt of many technologies and systems interacting. That is not to say we shouldn’t TRY to understand them, but it is to say we should show more humility with the further creation of new technologies. 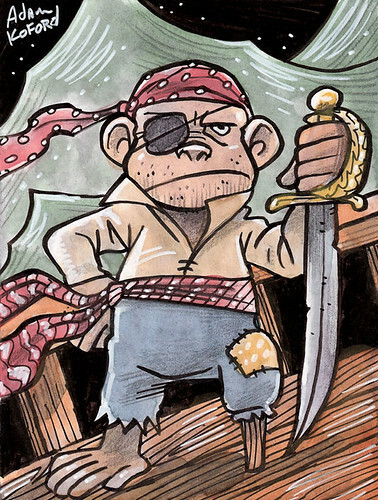 I will now demonstrate a complete lack of humility by inserting a cartoon of a monkey pirate. You didn’t see that coming did you? Alltop is funnier than monkeys, pirates and robots combined. Originally published June, 2011. Previous Post Ask General Kang: How do you choose a new leader?